I recently took part in the Shuffle Festival, a 24 hour festival in London’s Mile End with the theme of “Gods + Idols + Lights.” In a glade nestled among tall trees and Victorian tombstones, the Shuffle science team programmed science storytelling and participatory art. Biological artists Oron Catts and Ionat Zurr led the building of a Golem incorporating mud, horse manure, compost, and flasks of cells from hamster ovaries and mouse muscles. Alongside, people sat on picnic blankets and folding chairs while actress Rayyah McCaul read from Julian Huxley’s 1927 short story “The Tissue Culture King” and I talked about Jurassic Park and synthetic biology. This is the first of two posts based on that talk. I love Jurassic Park. In the mid-1990s, my father came home with ungainly fake-wood-paneled speakers that he set up in different parts of our living room, we popped in the VHS tape, and…That first herd of CGI dinosaurs! The soaring score! The glass of water! The ominous footsteps! T-REX! Cutting edge sight and sound technologies heightened storytelling to a mind-blowing intensity. T-Rex at the London Museum of Natural History. 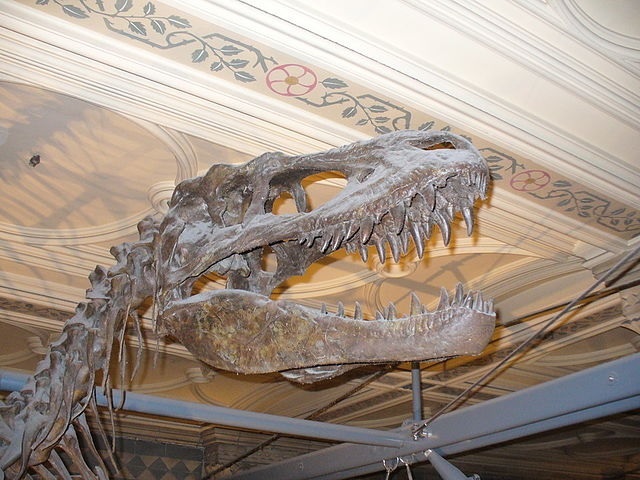 Disappointingly, there is no picture of a dinosaur in a lab coat on Wiki-media Commons. Yet. Today the original Jurassic Park is still invoked, no longer as the cutting edge of movie technology but because of its science. When asked whether he had visited genetic engineering firms in preparation for the book, Michael Crichton replied “Why would I? They don’t know how to make a dinosaur.” But the basic idea of the science of Jurassic Park – that the ability to sequence DNA seamlessly led to the ability to construct an organism – mirrored expectations of genetics at the time. Through DNA sequencing, the Human Genome Project was going to make possible new levels of control over and intervention in our own genetic material. This promise of control, however, did not pan out; one of its legacies was instead greater appreciation for the roles of complexity and contingency in genetics. But the promise of simplicity and control didn’t die. Synthetic biology’s engineering approach to life can be seen as a way of designing in the desired simplicity, so that biology can be rebuilt rationally. An international network of labs are currently collaborating to construct a synthetic yeast genome; the project aims not just to re-construct the sequenced genome, but to re-design it to be more amenable to control. The majority of uses of synthetic biology that are at or near commercialization involve engineering industrial microorganisms to produce high-value compounds, such as vanillin and the anti-malarial compound found in the shrub Artemisia. Looking beyond the immediate horizon, there are countless promises of what synthetic biology will deliver. Directly reminiscent of Jurassic Park, some “de-extinction” projects make use of synthetic biology tools to work towards creating organisms physically and/or functionally similar to extinct species. For example, the US-based foundation Revive and Restore is supporting research to adapt elephant DNA to include woolly mammoth traits. I’d like to use a different set of “Jurassic Park Effects” to describe how I’ve seen Jurassic Park used in conversations around synthetic biology. 1) Jurassic Park serves as an assurance that we’re not there yet, that science has not yet progressed to the point that it needs to be governed differently. Negotiators for the Cartagena Protocol on Biosafety rejected including nucleic acids from fossil or resuscitated organisms because Jurassic Park was “good fiction” but not reality. Today, reporters keep asking, how close are these de-extinction projects to Jurassic Park, really? This leads to a focus on the novelty of scientific practices, such that they are not open to contestation, critique, or question unless they meet the test of being really new. Scientists alone, so it goes, are best qualified to judge this novelty. 2) Dinosaurs are obviously terrifying. A main lesson of Jurassic Park: bring back a velociraptor, and you will end up huddled in the kitchen, one yellow eye peering at you through the window, while the doorknob slowly starts to turn…. The disaster spectacle of Jurassic Park is obviously part of its invocation, but not necessarily as a warning. In this TedX webcast, Carl Zimmer a) invokes Jurassic Park; b) explains that dinosaurs aren’t possible; and c) offers instead the Stellar sea cow, a giant extinct manatee. Not only is this reassuring that scientists are choosing safer research subjects, dinosaurs are also a threat whose dangers are obvious. In Jurassic Park, control mechanisms fail in unexpected ways, but the results are exactly as foreseen: humans are ripped apart. 3) Jurassic Park is invoked as a way to signal distrust. This goes two ways: that we can’t trust arrogant scientists who believe their own promises of control; and that we can’t trust the uneducated public (or journalists, or decision-makers) who are gullible enough to be influenced by a scary story of impossible dinosaurs. In these ways, Jurassic Park has come to operate as a shortcut, shutting down discussion of important points. In what forums can we explore the kinds of societal relationships that particular scientific projects enable? Can we examine the overall trajectory of particular scientific developments, rather than the novelty of the latest headline-grabbers? How best can different kinds of expertise and perspectives be brought into a project so that the less-obvious, unintended impacts are noticed? What kinds of accountability mechanisms need to be in place for actors to begin to move towards trust? So, as much as I love Jurassic Park, I think it’s time we move on to other stories. In my next post, I recommend an alternative story with the potential to open up, rather than close down, discussion. In the meantime, what “Jurassic Park Effects” have you seen? What stories would you prefer? Please share in the comments!